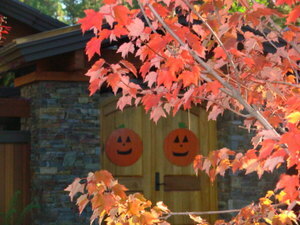 Notwithstanding the incredible Indian Summer which is continuing (86 degrees today! 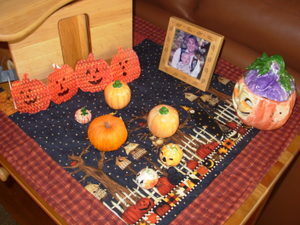 ), fall has appeared in the last week or so around here. Chloe got so excited about Halloween, she couldn't help herself. All photos are clickable. 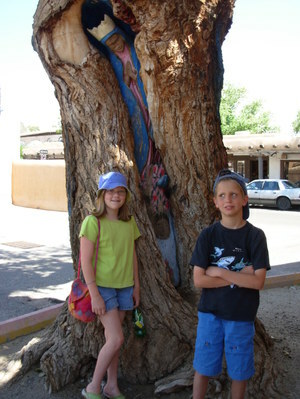 This photo of the kids was taken when Chloe was about 4 and Ryan 3. So cute! 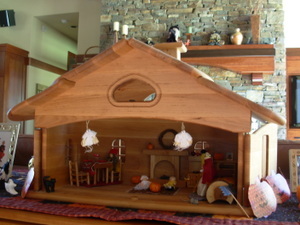 This is one of Chloe's dollhouses, which comes out just for holiday decorating. There's a witch on the chimney. 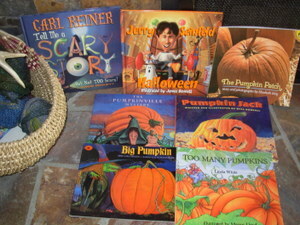 Halloween books have center stage right now. Ryan! Ryan is 12 today! 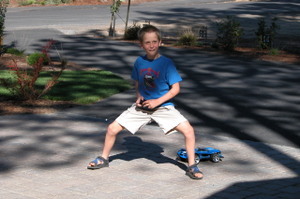 Ryan loves science, machines, dinosaurs, electricity, trains, monster trucks and anything else that runs by a motor. 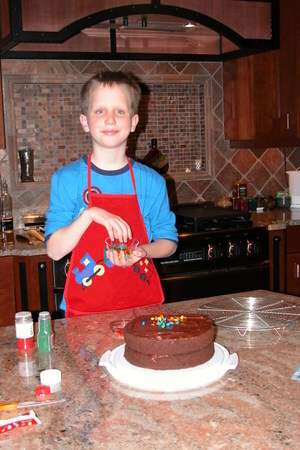 He also loves to cook, ride bikes, swim and hike. He loves to travel and go camping. 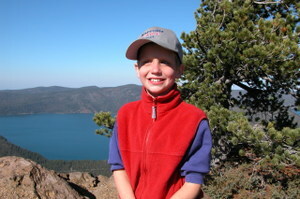 Ryan was born 12 years ago under less than ideal circumstances. The day after moving into a new house I had another bleeding episode. It was 2 weeks before his due date and I had been diagnosed with placenta previa several months before. It was scary, but we went to the hospital for a routine check. They started talking emergency C-section and I was feeling really good about it even though Ryan was supposed to be my home birth (Chloe was born in a free standing birth center with just a midwife). Anyway, Ryan had an apgar of 2 and was revived and given oxygen for 12 hours. It was a difficult time because the hospital pediatrician gave him antiobiotics without our permission and immunizations we didn't approve of. When I was ready to come home they said he couldn't because he needed IV injections of this antiobiotic. Mark was our savior during this time, being the advocate for both of us. He insisted that Ryan should be able to come home and we could get a visiting nurse to handle the injections. We worked that out, then after the 4th day, when the injections were done, we were told he needed to have his hearing checked because the antiobiotic, gentamycin, can cause hearing loss. We were incensed!!! I couldn't not believe how many things were bungled and how much we were not informed of. Well, he had an infant hearing test which was fine and had several more hearing tests over the years for his speech delay. His hearing has always been fine- even hyperacute which caused some behavioral issues along the way. On top of all that, my mom, who had come to help developed pneumonia while she was visiting and Mark ended up having to take care of me during my recovery from a c-section, an infant, a 19 month old toddler and his mother-in-law with pneumonia. What a difficult month that first one was! 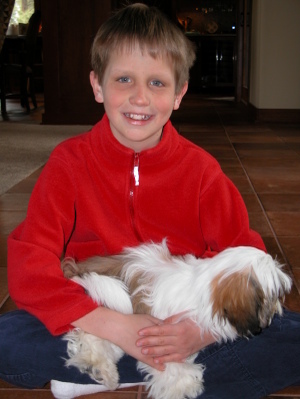 Ryan was diagnosed with strabismus at the age of 6 months and had surgery at 8 months in both eyes. 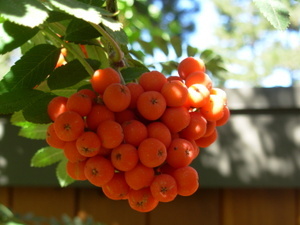 The effect of the surgery was immediate and dramatic. We brought him home and almost instantly he was looking at us and smiling from across the room, something he hadn't done before. 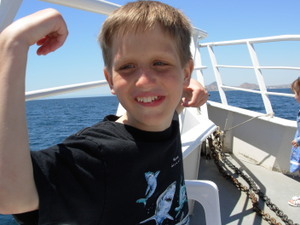 Over time we discovered his development was delayed in almost all ways, but he was always a smiling and happy boy. 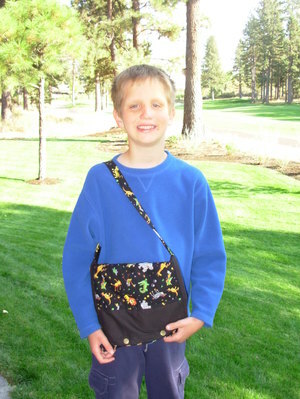 He was diagnosed at age 6 with autism, then re-evaluated this year and told he doesn't have autism. 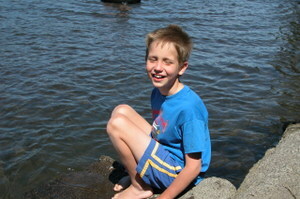 We've been told he has cognitive delay and will most likely not live independently. It's been a roller coaster raising this boy, who is not so little anymore. His strengths are his sense of humor, his unabashed love for his family and his determination to do what he wants to do. He is the most persistent kid I know. Ryan is a great kid and we just love him! Happy Birthday, sweetie! Well, we're home after a 3343 mile road trip! And that doesn't include the driving around the cities. 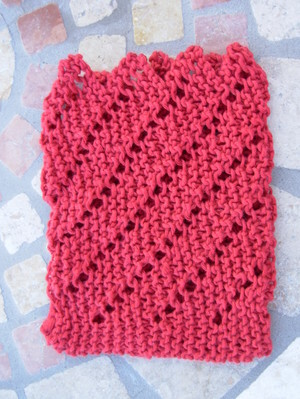 I thought it would be good to see how I did with my bin o' yarn even though I know it's going to be pitiful. Here's what I came home with. Please ignore the big bag. That's the super-secret project that will have to wait a while yet to be revealed. Meanwhile, what's inside? First off, the projects that got no attention what-so-ever. Charlotte's Web and Branching Out. I'm sorry I didn't have time for them because I do love their rhythm. 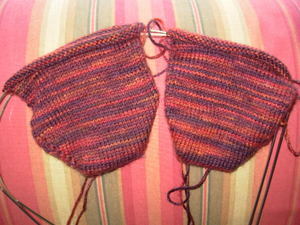 Next, the socks which I intended to finish at least one! I made a bit of progress on the Mountain Colors Bearfoot socks at the conference, but the others got only one or two extra rows. 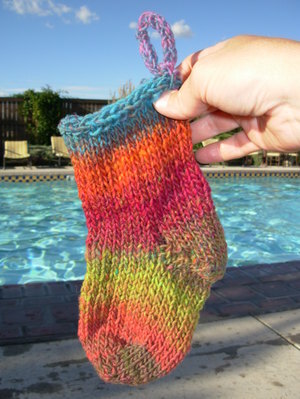 I think the "pool" socks look just about that same as they did that day at the pool in the first few days of the trip. 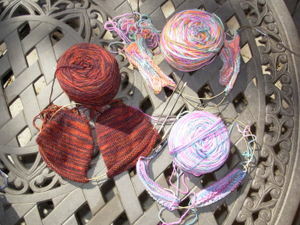 Luckily, I'm doing Socktoberfest with Lolly and have plans to work on these during the month. 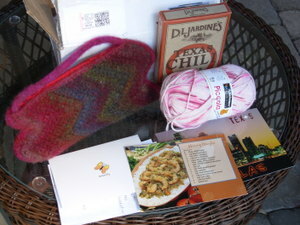 I bought some other yarn on the trip that I may not have mentioned. On the right is the Wool of the Woods Cameo that I got in Winslow, AZ. It doesn't look like much here, but it is so beautiful and incredibly soft! The rest is the baby cotton I got for washcloths and soap sacks. I'm not even done with one, but I'm hoping to get to that this week. Lastly is Hana's sweater. 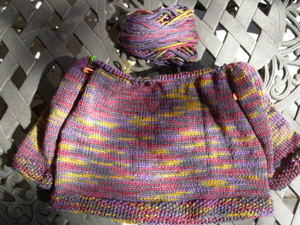 This project has had a lot of progress this week, so it doesn't really count as knitting on the road. Her birthday is next week, so I'm going to finish this before I work on the other projects. 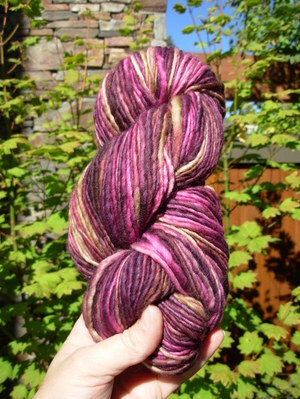 This is Lorna's Laces Shepherd worsted in the Tuscany colorway (I think). I wasn't really sure about these colors in the ball, but I had 4 skeins and knew that the resulting sweater would be soft, warm and most important-washable. Now that I've been working with it I really love the colors. They are much warmer in real life. 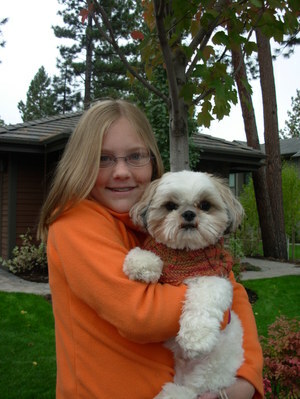 This is the Child's Placket Neck Pullover from Last-Minute Knitted Gifts. There are so many problems with the published pattern you have to print it out online. Now, here are my sewing room companions. 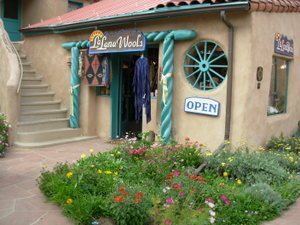 Lana is on the left, she came from La Lana Wools in Taos, NM. The other one is my childhood companion and has never had a name. I'll check with Chloe to see if she has any ideas. They look nice together, don't they? One last photo of this new Manos I picked up the other day. 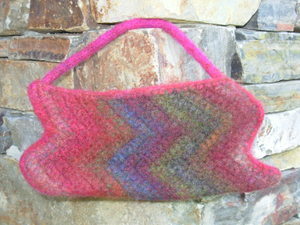 This is for a moebius basket that I'll be making soon. It's a gift for someone who shall remain nameless for now. Pretty colors for a fall day! 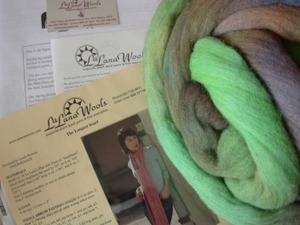 I finally got my trip to La Lana Wools today. 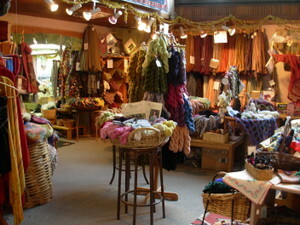 I've been thinking about coming here ever since I first heard of their lovely yarns. I had the shop to myself for the most part with the kids playing outside in the little courtyard. It was incredible to see the creativity in that shop. I'm so glad I finally made it to Taos! 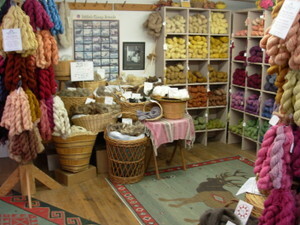 The only disappointment is that I can't stay in Taos until the Wool Festival in October. Now, that would be something! 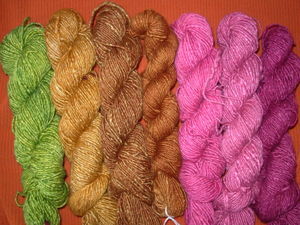 The plant-dyed fibers are exquisite! There are lots of different fiber contents to choose from, so it was hard for me to decide. 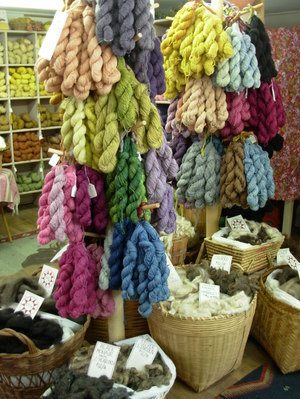 I had intended to get some of the Forever Random blends, but they are only available in 100% Romney wool, or wool and mohair blends. 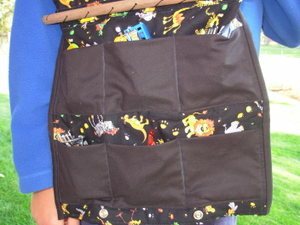 They seemed a bit scratchy to me, so I hemmed and hawed and finally chose something quite different. Below you can see the Phat Silk (fine on left and phat on right). I chose the fine, which is 50% wool and 50% silk. The colors are amazing. Here is what I chose. 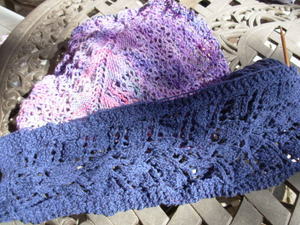 I didn't have any particular project in mind, but I think these would make lovely lace or entrelac scarves. The green just called my name and I had to have it even though there was only one skein. I'm not sure what I'll do with it, any suggestions? Each of these skeins is approximately 142 yds. I didn't stop there, though. This ball of roving was in a clearance bin, probably because it's chemically dyed, but the colors are so pretty I couldn't pass it up. The scarf pattern was free (due to my incredibly expensive yarn purchase) and I also got a brochure explaining the dyes and fibers they use. Lastly, I got a new friend. 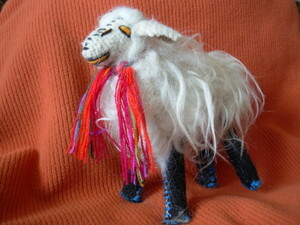 Meet Lana, my new Chiapas sheep. She will join my llama I already have gracing my studio. 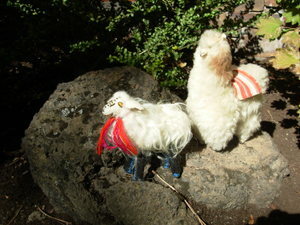 The llama I got as a very small child from a family friend who picked it up in South America. I guess if Lana has a name, the other one should too. I'll show of picture of him when I get home. This morning was also a milestone for me. 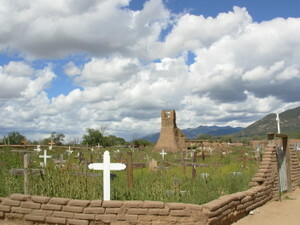 I have wanted to visit Taos Pueblo for 20 years and we finally did it today. 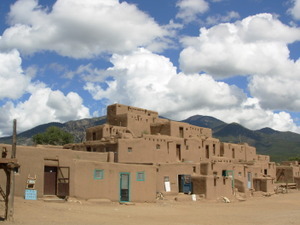 The pueblo has been lived in continuously for 1000 years and still looks much the same. 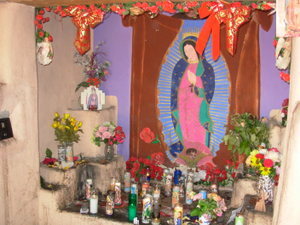 It is a humbling place to visit and I got some wonderful photos. I'll post a couple here, but more will be on my other blog. The past 2 weeks in New Mexico have been an incredible treat for me and I'm so happy we had a chance to do this. Tomorrow we start the long drive home to Bend. We'll be stopping in Colorado, Salt Lake City and Boise. I'm not sure when the next post will be, but I'll be back! 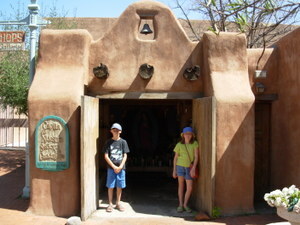 We got into Santa Fe yesterday and walked around the plaza area. It was sort of late so most shops were closed, but I got these two photos at one of the hoity-toity fashion shops. 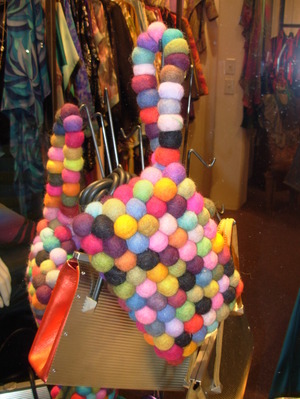 Look what people are doing with little felted balls. Does it remind you of anything? I had to take a photo of this one too. 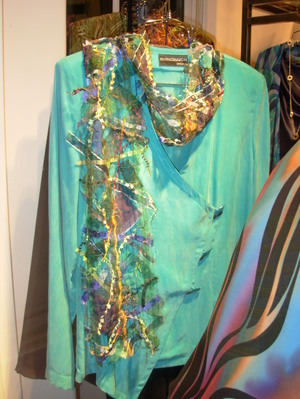 Chloe figures we could make a threaded scarf like this one in no time flat. 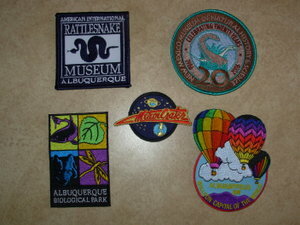 Now, for the record, I'm a patch collector. If I go somewhere and they have a patch, I'm gonna get it. I'm not sure how many I've gotten so far on this trip, but it's quite a few. I just bought two more today that I don't have photo of and I think I have a few stashed somewhere that I couldn't find for this photo. What will become of them? Well, I'm thinking a patch quilt someday, but who knows, perhaps I'll just get them out and flip through them like trading cards. We'll see! 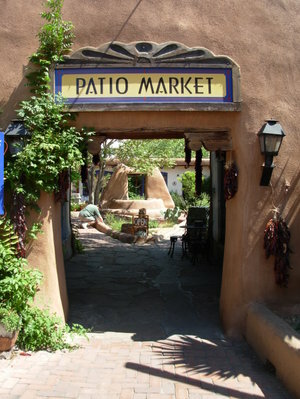 To brighten the blog a bit, here's a photo from downtown Santa Fe. To distract you from the fact that there is no knitting content I can show you*, I thought I'd better get to Q. I bet you thought it would be Quilt, but it's not. Q is for Quest. 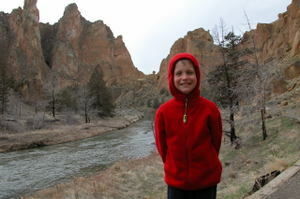 We've done a lot of quests lately in the form of geocaches and letterboxing. 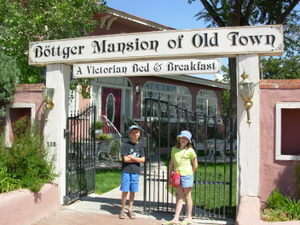 Today was the latest and we got some nice photos of Old Town Albuquerque, so you will get to see travel photos afterall. First off, we went looking for The Lady of the Tree, a little known secret in Old Town. We found it very quickly. Then we went looking for a geocache called Old Town Ghost Tour. This is a multi-step cache with 11 stops. Along the way we found some really cool areas of Old Town we hadn't seen before. This old mansion is said to be haunted by at least four ghosts. 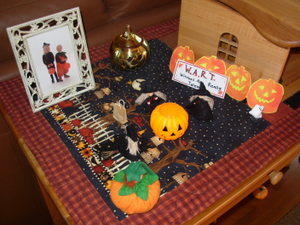 The Servant's Quarters: They say the spirit of a young boy lingers there and he moves things around and night and helps himself to the candy bowl. 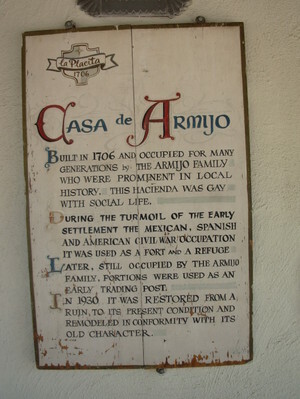 At least four ghosts are said to haunt this building as well. 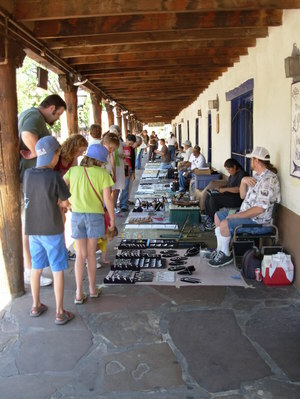 It's also the porch with the open air jewelry market. 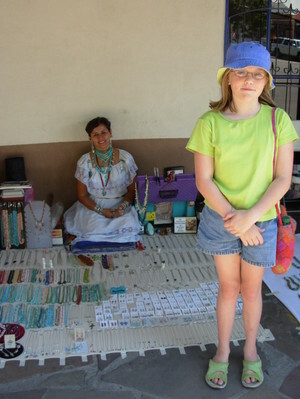 Chloe and I bought beautiful silver and turquoise earrings from this artisan. Here's where the cache is located, though we couldn't find it. It's always disappointing to not find a cache! Chloe and I looked around for a long time, so I'm not sure if it's still there, though it was found only a few days ago. 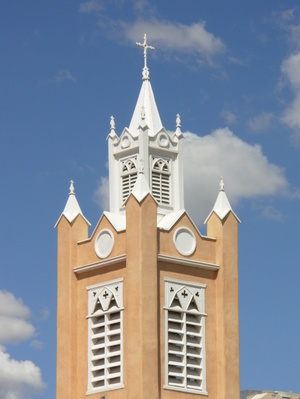 This chapel has a couple of surprises inside. The cache is supposed to be near the circular window, but we didn't find it. 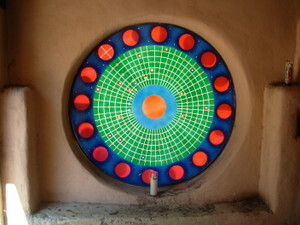 Now we have to plan on coming back to Albuquerque some time, just to finish this! We had a wonderful time in Old Town over the past week. 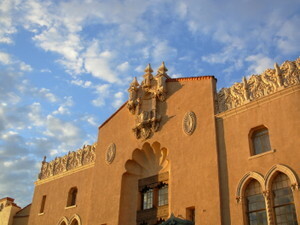 It's definitely worth a visit if you ever come to Albuquerque. 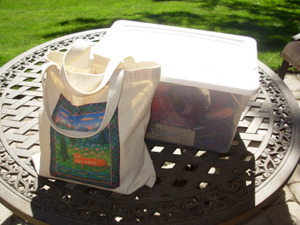 * I've been knitting, but it's my super-secret project that I just can't show. Be patient because it will make an appearance sooner or later. The Live & Learn conference started a couple of days ago. It's an intense time with activities going on all day and into the night. We all are having fun and meeting new unschoolers which is a great thing. 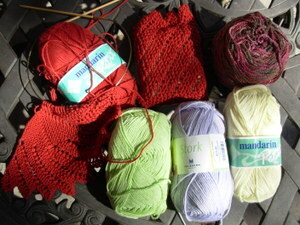 In the spare moments when I'm listening to a talk I've been knitting little things. Some I have no plans for, but to try to sell them. If they don't sell these will be little gifties for someone! 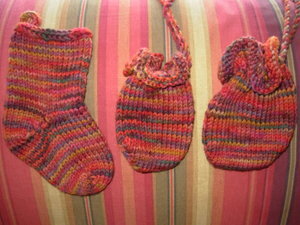 Mini stocking ornament and two little pull string pouches. 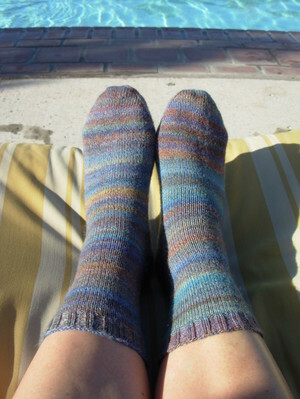 I've also been working on a pair of socks. 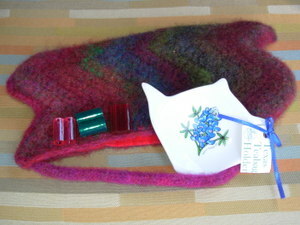 These are from Mountain Colors Bearfoot- colorway Red-tailed Hawk. How could I resist?